Our 1940's adobe home sits nestled in a quiet, wooded area just a ten-minute walk from Historic Taos Plaza. Spend a lazy afternoon relaxing in our hammocks, snuggle up with a book by the fire or unwind beneath the stars in our hot tub. Dreamcatcher is your perfect home base for exploring Taos and all that northern New Mexico has to offer. Taos offer quick access to three ski areas, exciting river rafting, hiking trails and biking. There are great art galleries, museums, fantastic restaurants and an abundance of unique shops. 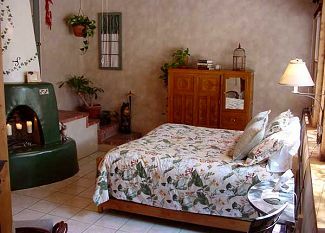 At Dreamcatcher bed and breakfast all of our rooms feature a private exterior entrance, private bath, wood burning or gas log fireplaces, coffee maker, refrigerator, ceiling fan, CD player, or TV, and comfortable robes. Our delicious breakfasts will be the perfect start for your Taos adventures. We feature cooked to order hot entrees and selections of fruit, cereals and fresh baked breads or muffins.